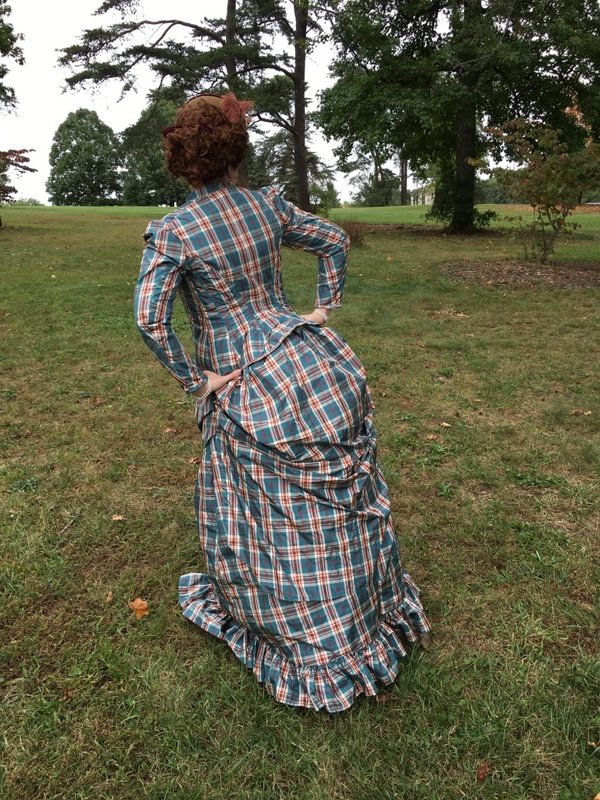 My first "buh, buh, buh, buh"...BUSTLE!! 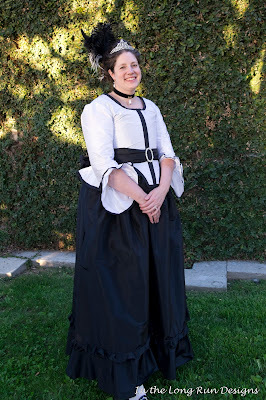 *SQUEEEEEEEEE* I finally made my very first Victorian bustle.......aaaaaaaahhhhhhhhhh!!!!!!!!!!!! Also a promise to finally get bustle for a friend's annual Victorian party private event done sometime this year, plus Carolyn from The Modern Mantua Maker was hosting a Big Bustle Birthday Bash in October (the pictures in this post), where bustle was preferred but late 18th century "big butts" were acceptable also! 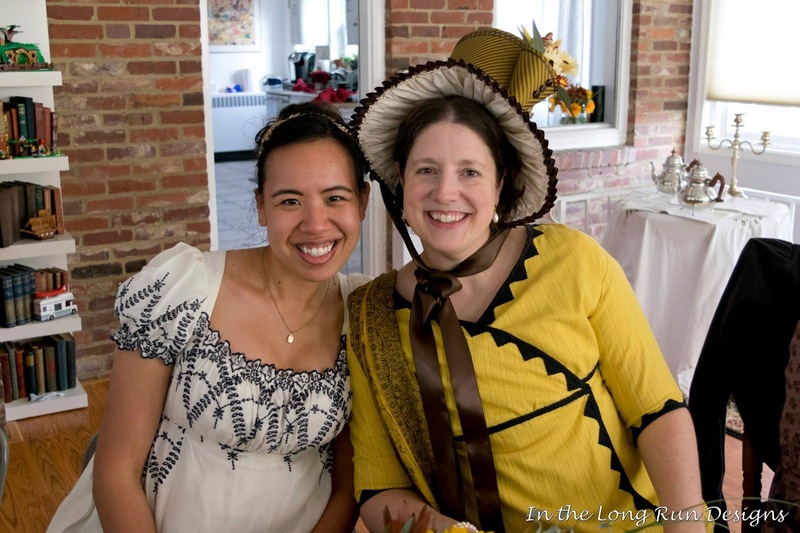 If I couldn't get my outfit together, late 18thc was my back up plan, but I pushed and pushed to finish before Carolyn's event and I'm so glad I did! I literally finished sewing my bodice an hour and a half before Carolyn's event started (so stressful) and immediately started doing my hair so I could get dressed for the event! I'm pinned into my entire outfit (no time for sewing closures). We had a picnic in a local park, with a really good turnout, it was quite an enjoyable day! 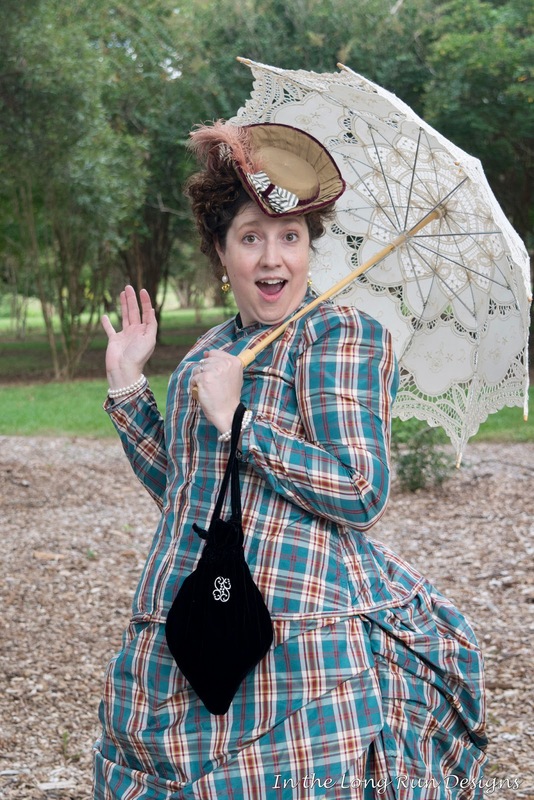 "Why yes, shocked I DO like wearing bustle!" It was a super fun event, other than a few pushy and persistent yellow jackets, which kept insisting on invading my personal space. *shudder*...we had a lovely time though, the weather was warm yet cool, muggy yet not too bad: lots of delicious food and enjoyable company, with beautiful bustle dresses everywhere! 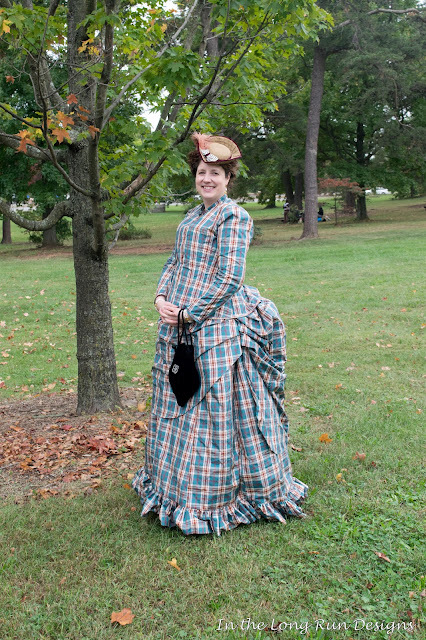 Really fun dress to wear, I enjoyed how the dress and silk fabric moved, and the gathered ruffles, it was just really enjoyable to wear, and just somehow felt "right." 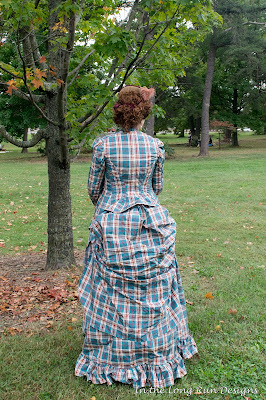 My dress is a blue green and red plaid silk (Jomar find!) 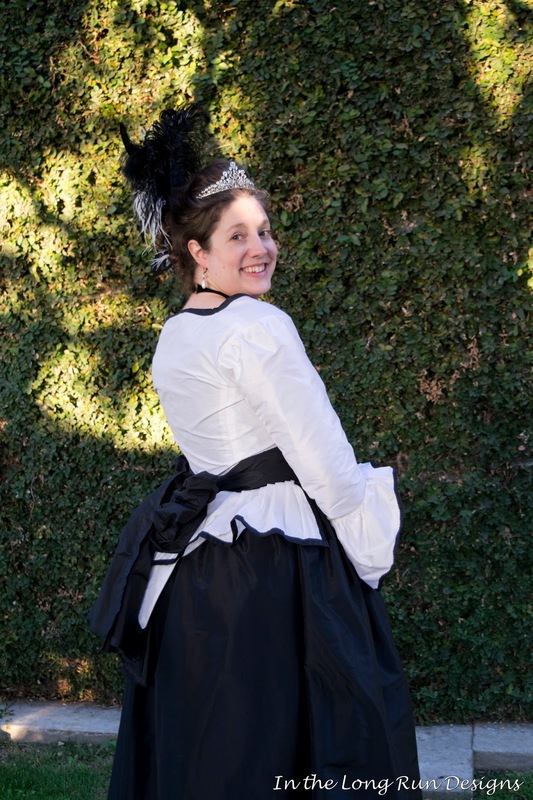 using TV460 Curaiss Bodice, with TV261 Four-Gore Underskirt, with TV305 Apron Overskirt. With TV101 Petticoat with wire bustle foundation (underneath, not pictured), with TV170 Victorian petticoats in cream silk petticoat (underneath, not pictured). Also TV110 Late Victorian corset (underneath, not pictured) in embroidered blue linen. Accessories: mini tricorn I made a few years ago, hair by me, with a red brown Lioness curly wig mixed in with my hair. Jewelry: real pearl and gold bow earrings plus matching real pearl bracelets by Lady Detalle, with a vintage pin I picked up years ago at the bodice neck. Cream lace parasol from Loren of Costumer's Closet in a purge she did years ago, and black velvet reticule by VeryVictorianStudio. American Duchess 'Balmorals' in black finished the look! All my photos from The Big Bustle Birthday Bash are here. A lovely day of fun, thank you, Carolyn! It's not often that a new fashion book is added to my core historical fashion collection, but this one is well worth adding! "The American Duchess Guide to 18th Century Dressmaking" by Lauren Stowell with Abby Cox includes all sorts of tips and tricks, as well as pattern grids for various accessories, and from what I could tell, how to build/sew a gown the 18th century millinery way. I've not dug in very far yet, and although I'm likely to use it more for inspiration than a straight how to (since I love 18th century and have made quite a few outfits to date) - still, looking forward to learning and trying things from here at a future point! You can get it on Amazon, thru American Duchess or many other sources I'm sure. 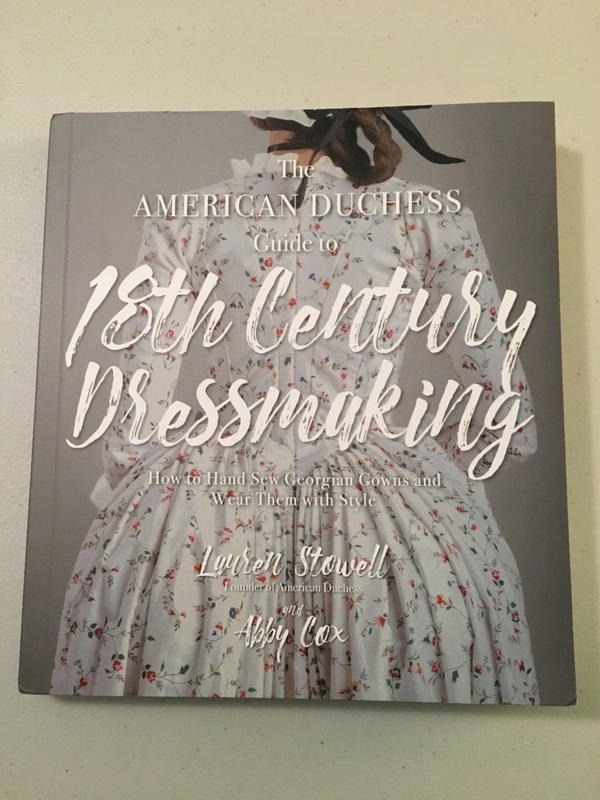 Recommend picking one up as a resource if you're interested in 18th century sewing! Black Friday Sale starts now at LadyDetalle.com "Historic Accessories & Supplies" and goes thru Monday night! 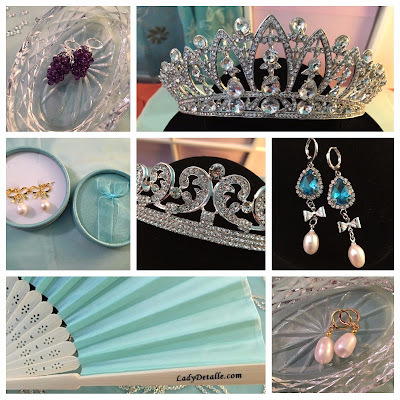 Check out the new CROWN tiara, Amethyst grape cluster earrings, Sparkly blue rhinestones with real pearl earrings or gold BOW real teardrop PEARL earrings, & much more! Over 50 new listings added! 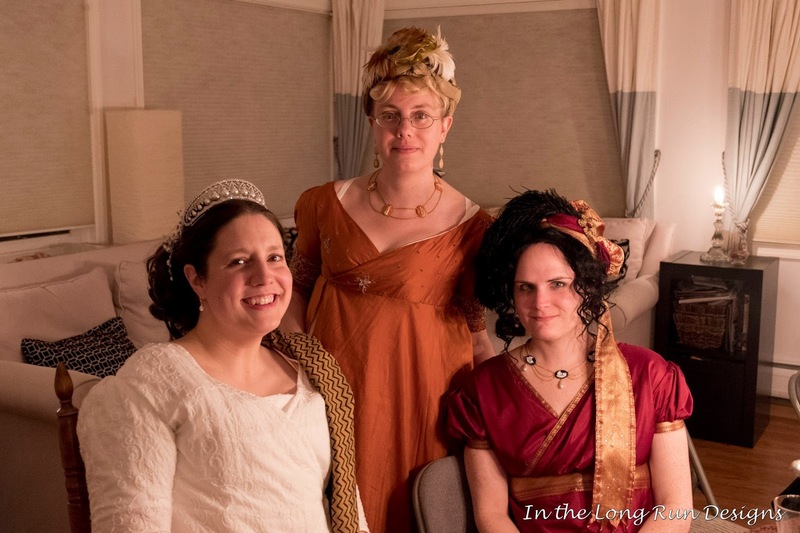 Yay, recently I hosted the 11th Annual Regency Pumpkin Tea, and (bonus) Candlelight Soiree the evening prior. The candlelight evening is a chance for us to have a preview evening (I first did the double event last year for the 10th Annual celebration) and to include men in our Regency party, as well as dress up in evening wear instead of daytime wear: it's always such a delight! So happy with my new bonnet, my commissioned "B" bee reticule and my bee muff! It was a lovely group of ladies! are picking a wedgie? YEAH, that's what this is, group Wedgie shot! Kat and I pose outside with our muffs! 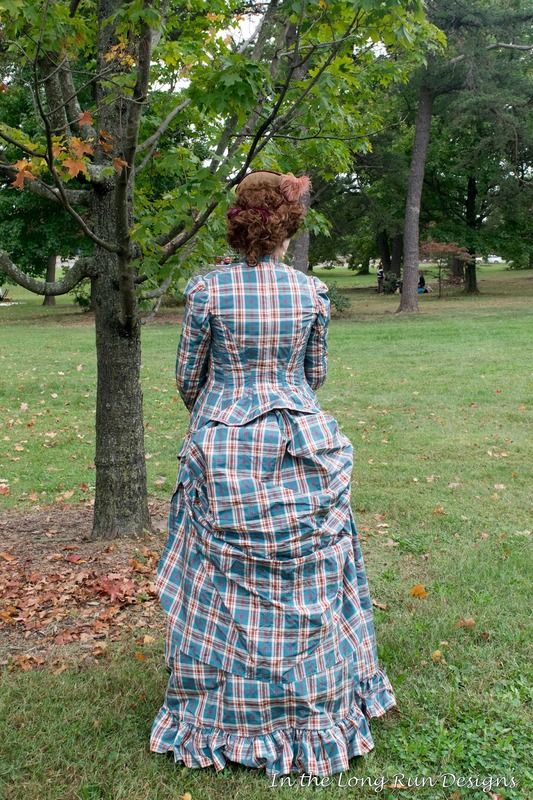 Kat made a new striped pelisse for the occasion, isn't it stunning?! During the candlelight soiree, we smile for the camera! A lovely evening of food, laughter and fun! The hb and I pose for a quick couple of photos! Here I am talking about the huge table of food! 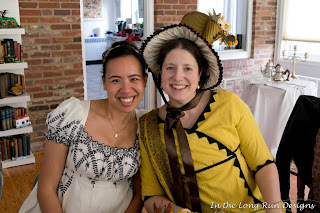 Ashley and I at the tea! Afternoon tea went by so quickly, with food, laughter, chatting and more. 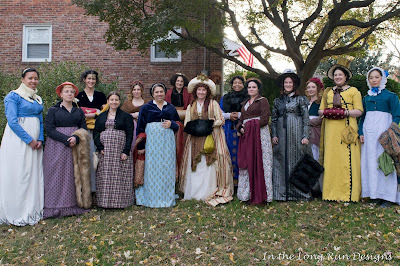 Then we retired outside for a group picture and some picture taking, before coming back in to do the fabric de-stash exchange, before more tea food, drinks and laughter. I re-wore one of my favorites, a mustard yellow striped cotton finished with black cotton triangle (Van Dyke) trim! 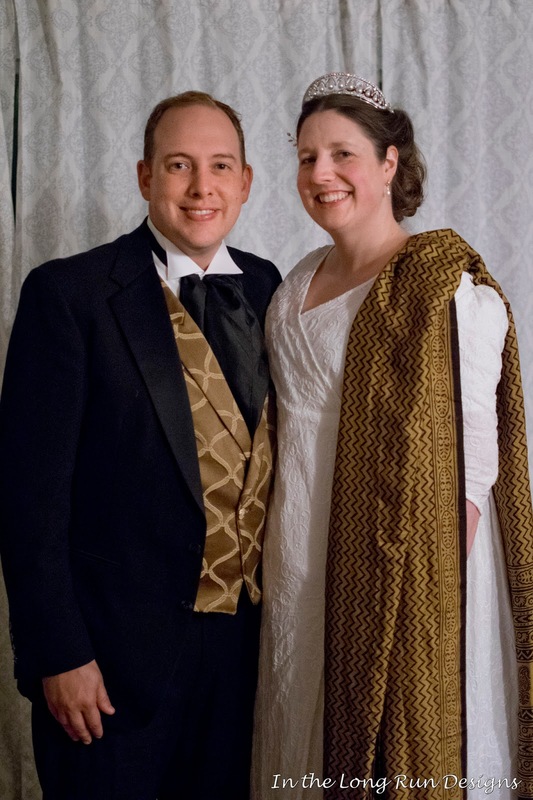 I commissioned a custom Regency stovepipe bonnet this year from 1800'sMillineryShop on Etsy, sending them a mustard and dark taupe striped silk (I have more fabric to make something up in future). I adore how the bonnet turned out, I'm very happy with their creations! Accessorized with a mustard and black silk vintage dupatta and real pearl earrings from LadyDetalle on Etsy. For the candlelight soiree, I re-wore my white embroidered cotton crossover gown with a vintage dupatta and a silver pearl reproduction tiara. 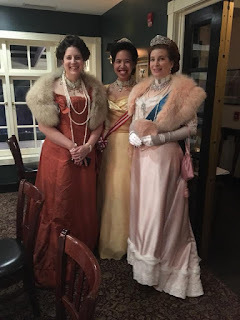 Had an amazing time with the lovely ladies (and gentlemen) who came out for the Friday candlelight soiree and the Saturday tea: thanks so much for joining in the fun! All of my photos are here! 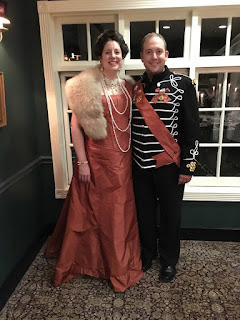 You do you...historical costuming resolution for 2018. This is my historical costuming resolution for 2018. YOU DO YOU. 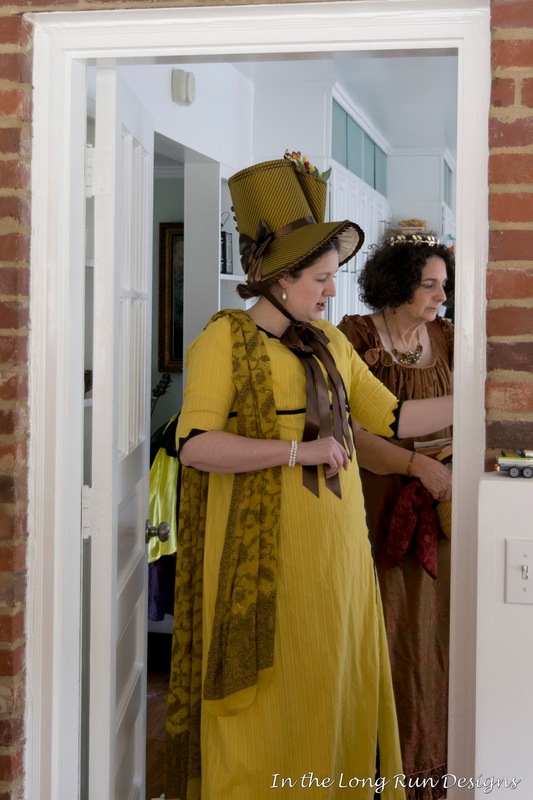 I'm a self-proclaimed historical COSTUMER. I've been a re-en-actor, dressing in HA clothes and doing demo dances for the public in historic houses/museums. I've been a costumer, dressing in close to HA clothes and going to private events or public events in costume. Historically costumed, I've been to fancy private houses, to fancy public houses, and everything in between: I've done demo dances for historic hours tours, I've been an extra in TV/film, I've been asked if I'm Amish, if I'm Victorian, if I'm in a play, or going to the Renn Faire, or if I work for Colonial Williamsburg, I've been photographed and featured on websites, in promotional videos, marketing materials, in newspapers, and in magazines, complimented by well-known politicians and more,and almost always in as-HA-as-possible historical costume. That's all great, but what matters is, I do this historical costuming hobby because it's F-U-N. I'm not saying this stuff above to claim some sort of fame - if it were about that, I'd list and share and mention every time "I was noticed" in this hobby - I'd tell you all about the who and the what and the why, but none of that matters. What matters is that this is my JAM, it's me. I'm appreciative of each and every moment in this hobby, the private ones and the public ones, because to me, that's what it's all about, the fun. 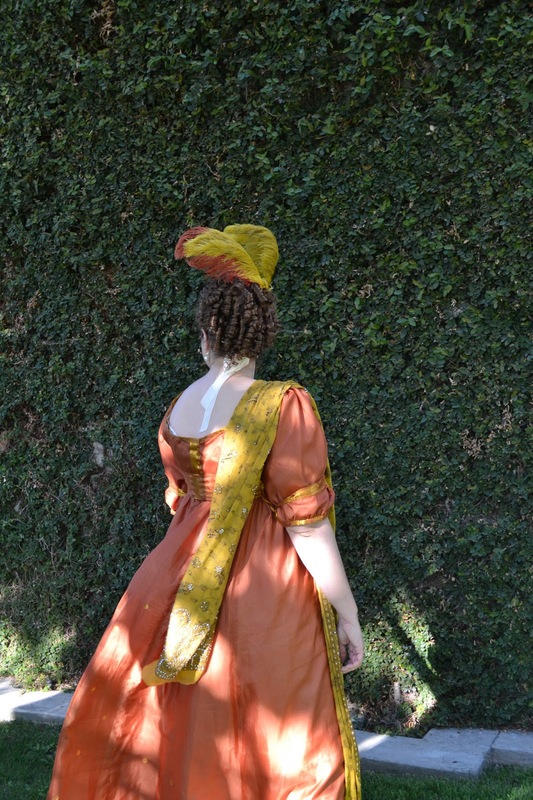 It's a way to enjoy myself, to express myself and to BE myself: I love to sew and I love historic fashion. I'm being me. Historical costumed me is me. In this our costuming and re-enacting world, I'm tired of drama, of being told to let mean girl behavior slide because 'we all need to get along.' I'd LIKE to all get along, but we don't NEED to all get along. And there's a difference. I'm not willing anymore to sit down and be silent when my friends are treated poorly, or when I am treated poorly. 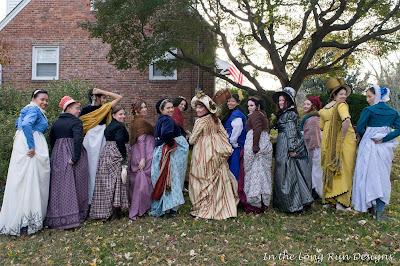 To ridicule someone in public or in private, online or not, who is taking part in this historical costuming hobby (or cosplay, or re-enacting) or to pick apart their attempts to join in this hobby simply because it's "not HA enough", or they used a zipper or faux fabrics, or safety pins or the look is 'off' or whatever - I'm sorry, there's NO excuse for that sort of mean girl behavior. We all started with zippers, and it's totally ok if you use them now (I personally safety pin myself into my costumes often because it's not seen and it doesn't matter to me). And if you somehow skipped the zipper phase, you're not special and allowed to push your own standards on others. If someone is asking how to be more HA, great, share away, but please do it in love and kindness. Anything else I've found is or becomes unacceptable behavior. 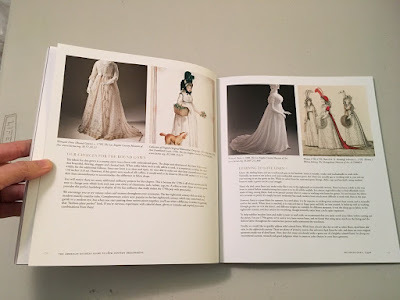 You do this to help others learn about HA fashion? Great, share away, in kindness and when they ASK for help. You graduated with a masters in this? Great! I have one too, just in business, not in theatre/art/fashion/costuming/sewing. I do this for fun, many of you do this for fun or WANT to do this, but are too afraid to join in. I learned how to hand and machine sew from my mother, who is a professional quilter, and I am self taught since and have also learned from other historical costumers too, over the years. Please know, Your standards are not my standards. My standards are not your standards. Their standards are not your standards. Historical standards are not THE standards - we have a limited view into what they did in the past and sure, we research and confirm and learn things, but that doesn't mean that it matters or applies to everyone taking part in this hobby, to each her (or his) own. 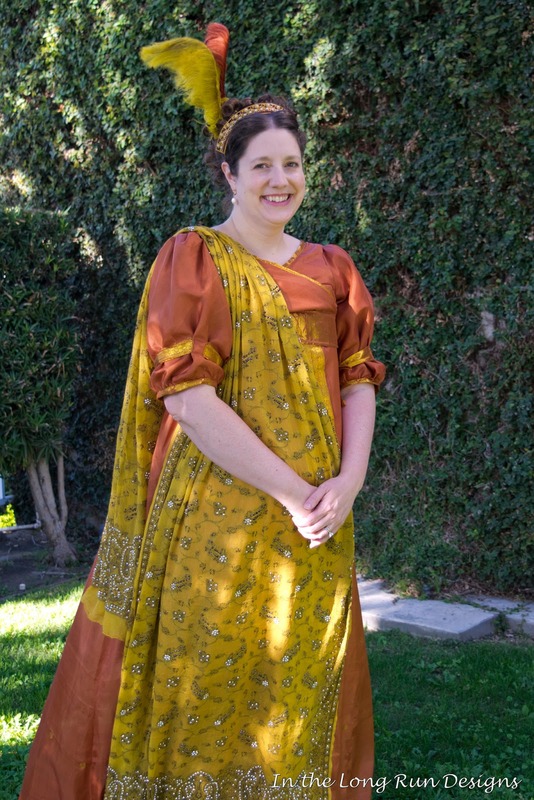 Historical costuming is my hobby. It's a way to be creative, to sew, to dream, to plan, to dress up in fun clothes, to try different materials and methods, to learn, to grow, to enjoy life. To have fun myself, with my family and with friends, with others who like to do this and even at times with the public. I do a lot of research, I pour over fashion plates and portraits and extant garments. I like using materials that are close to what they had back then, I like to get the look close to what I see in the fashion plates and the portraits, and later the photographs. And I'm a SILK ADDICT, so yeah, I use that stuff A LOT. But the reality is, we often don't have the same materials, we don't have the same fabric or weaves, and we don't have the complete picture of what they did back then, because we only have snapshots and little windows into the past. I love to hand sew! I started young, with quilting as a child, but I don't do this full time. And I adore my sewing machine. I do both hand and machine sewing. And I have a small business that I do for fun and to help support my hobby, and because business is fun to me. 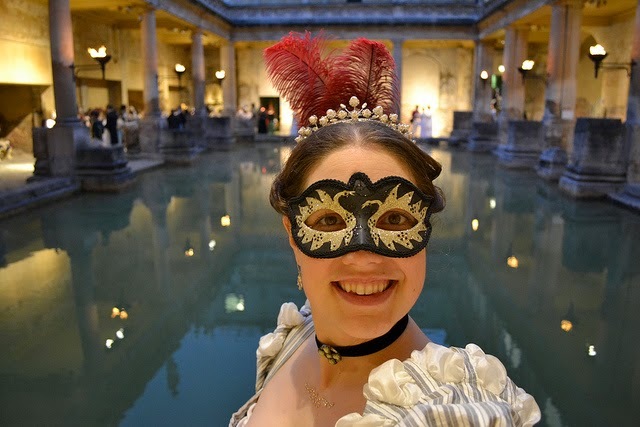 I limit myself in historical costuming by my budget, time constraints, skill, other interests, family commitments, business, my career choices and so much more - by my choice. Yes, I like to be HA, but I'm not asking how to be so. I do my own research or ask for HA opinions when wanted. My standards are not your standards, they are mine only. I do me. You do you. I stress again, this hobby is all about fun, for me, for my friends, for many others. If you're in this for fame, and you're miserable because you're not noticed or because someone else gets noticed, then we're probably not a good costumer friendship match. I'm happy for others successes and I'm here cheering you on! And there are many others who feel that way too! If you want to be invited to events to feel good that you're popular, but you have no intention of ever going or you only go to turn up your nose at things, or you're a bad guest to the hostess or other guests, we're simply not going to gel. And that's ok. Private(and public) events take a lot of time and effort, and my 1-2 costume private events a year I'm space limited. In the past, I've invited folks to be nice or to include or not make waves, but that's a thing of the past. No more. Personally I'm done rewarding or ignoring bad behavior. I'm resolved to take back my enjoyment in this hobby. I hope you join me. And like so many of you out there, I'm an introvert. An extroverted introvert, but an introvert non-theless. For someone who likes to dress up and have fun, I'm a fairly private person. 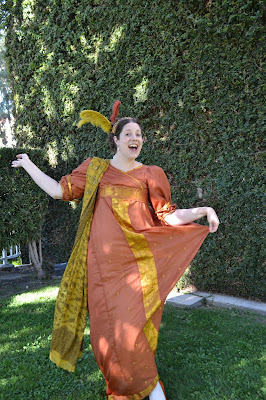 Sharing my costumes and sewing adventures online doesn't come natural to me. Sharing this here is definitely a huge step for me. There is no secret club, at least not one I'm in - I've just been doing this awhile, and so have others and we've all gotten to know each other over time. Many of us poured out our lives together, the good and the bad, on venues like Live Journal, and we bonded over a shared love of historic fashion and empathy over life's struggles. I know some wonderful folks in costuming, those are the people I'm going to surround myself with, along with new costumer friends, folks who believe as I do, who do this for fun and who I become friends with over time. A dear costumer friend passed away two years ago yesterday, who had the kindest and most welcoming heart of any costumer I know. 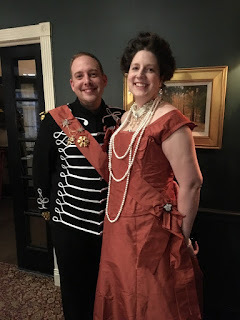 She knew her HA and did it spot on, and yet still welcomed me to my first private fancy costumed evening (late 18th century Twelfth Night) with open arms and a welcoming heart, even as I stepped in, with my faux taffeta late 18th century pocket hoop gown, an early attempt at HA. That didn't stop her from encouraging the beginner that I was in historic fashion. Let's take a page from her book and treat each other with kindness always. I do me. You do you. 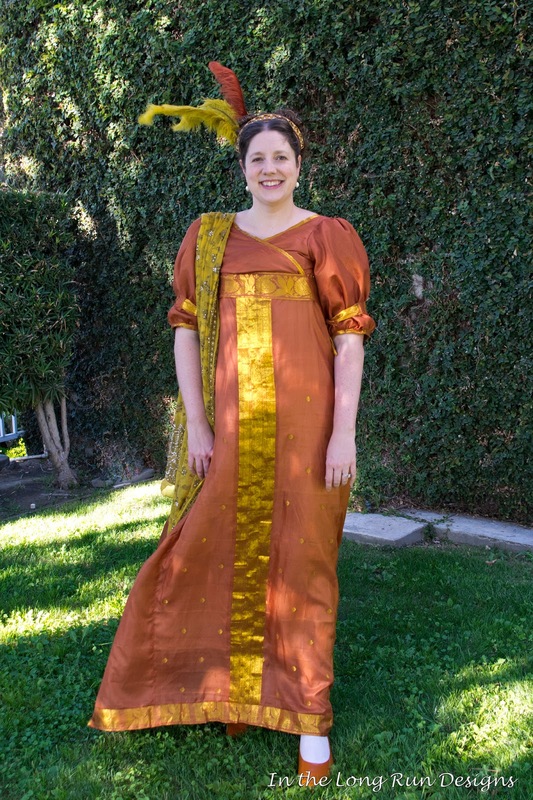 My outfit: I re-wore one of my favorites Regency gowns, a mustard yellow striped cotton Regency crossover gown finished with black cotton Van Dyke triangle trim that I finished a few years ago! But hands down my favorite part of my outfit it my NEW BONNET!!! I commissioned a custom Regency stovepipe bonnet this year from 1800'sMillineryShop on Etsy, sending them a mustard and dark taupe striped silk (I have more fabric to make something up in future). I adore how the bonnet turned out, I'm very happy with their creations! Paired with a mustard yellow and black silk vintage dupatta, pearl bracelet and earrings by LadyDetalle on Etsy. 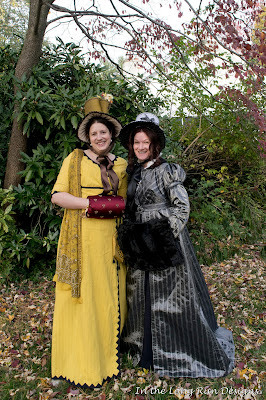 Unfortunately no time to make a new dress this year, since I had two full outfits to make in the 5-6 weeks prior! I'll post more photos and about the tea soon! Costume College 2018 theme is really inspiring me! I'm really inspired by "Dressing the Royals" theme of Costume College 2018! I just finished my 1898 evening/court gown for the Last Csar Dinner, and I have some court wear from previously worn outfits, including CoCo 2016 Gala. 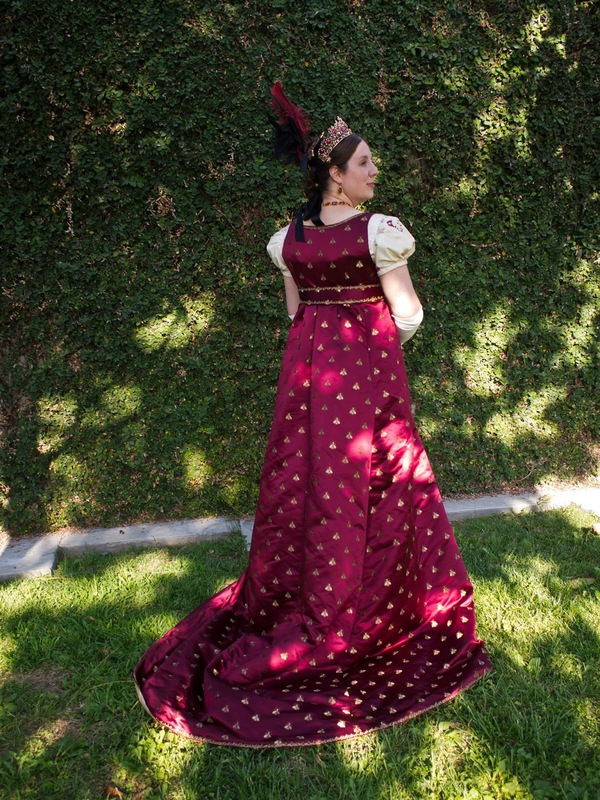 I'm pondering on if I should re-wear all my court wear at Costume College this year - so tempting! Although I'm also inspired to sew some new things and revamp some previously made outfits (including the court wear), so in the end, it will probably be a little of both. I stumbled across this photo that I had forgotten about, in Gloria's CoCo Flickr album: photo by InTheLongRunDesigns. I love the way she captured the sun and shadows on my Napoleonic Bee court robe from Costume College 2016 Gala! I have never felt so completely regal and ready to be or visit royalty that evening, than I did in this gown. Time for some CoCo Royals planning! What are you planning for Costume College 2018 theme?! Costume College always goes by in such a blur! I'm long overdue in posting but I wanted to say I really enjoyed my trip to CA this past summer, and the time spent with friends and meeting new friends! There's usually a few bumps along the road, in an otherwise fabulous trip. Thursday was a trip to the L.A. Fashion District with a car-ful of costumer friends, to scout out some great deals. I went home with a er *cough*ridiculous*cough* amount of silk yardage to add to my stash. I'm making lots of dresses this year and next! If I wasn't before, I am now, LOL! Lots of great deals and fun was had, and I really enjoyed fabric shopping with friends and running into other friends in the fabric district! All of my costumes at Costume College were re-wears: none had I worn to Costume College before, but they had all been worn before, made for various events. I love re-wearing and re-accessorizing outfits, you get different and better pictures often in new settings! 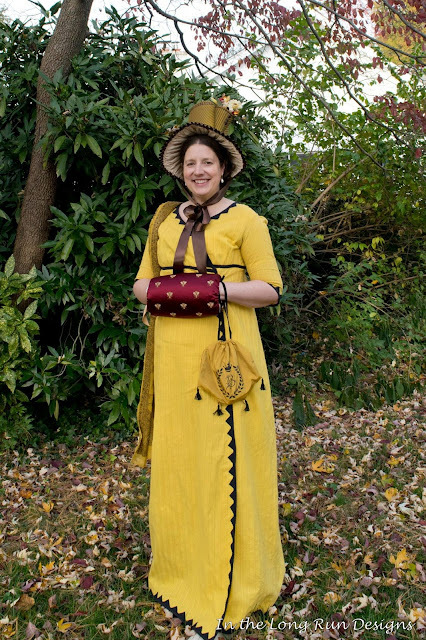 Friday I wore my "Strawberry Picking" Regency (JoAnn's quilted cotton print) with my Regency stays and shift, white apron and mustard and black silk fichu. Paired with my beloved American Duchess Hartfield boots, these boots are super comfy! Hair by me (my hair with half wig of brown curls pinned on the back) and jewelry is Dames a la Mode pearl earrings with a vintage blue stone necklace. 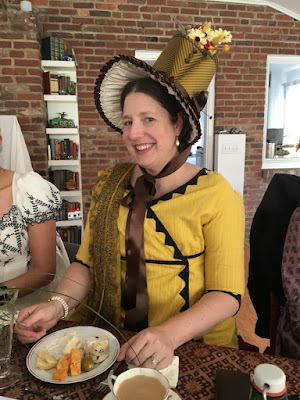 I taught on Friday, so I changed before class, so only wore this outfit for a little while, but it was enjoyable just the same - I really love Regency! Friday evening I wore my white and black silk 1780's jacket, paired with my black silk ruffled petticoat, black sash with large rhinestone buckle, tiara from LadyDetalle, earrings and necklace by InTheLongRunDesigns. We had a non-rushed dinner at Corner Bakery before dressing for the Social, so we arrived quite late. 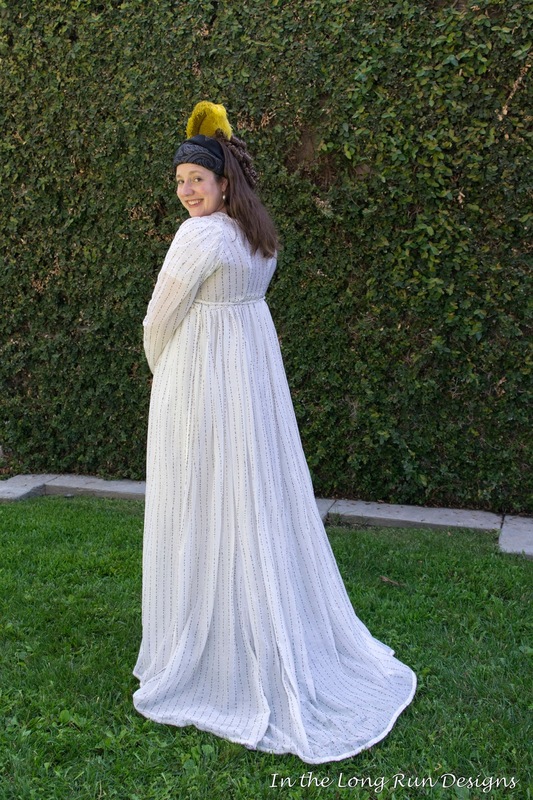 Saturday day I wore my late 1790's white sequin striped silk/cotton gown, with my Regency cream silk and white marabou pelerine, paired with a "B" and "bee" mustard and black silk reticule made by my friend Vanessa, a black shawl wrapped as a turban, mustard yellow feathers, pearl earrings by Dames a la Mode and my American Duchess 'Hartfields." 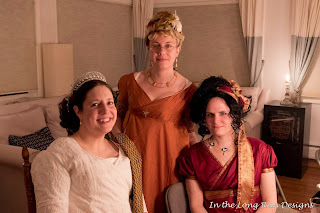 Saturday evening for the Gala, I wore my Regency orange silk sari gown, paired with pearl earrings from Dames a la Mode, garnet tiara by Bohemian Belle, my hair with added bouncy brown curls in the back, my painted orange American Duchess 'Pemberlies', and a vintage mustard dupatta. edging to create the trim down the center front! 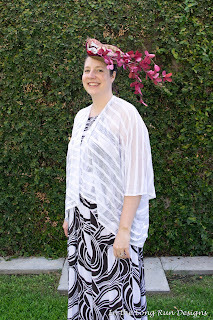 Sunday I wore a modern sundress and white pullover and paired it with my mini tricorn with a huge, crazy amount of paper flowers on it, for 'wear crazy **** on your head" day at CoCo. Another fun Costume College experience! 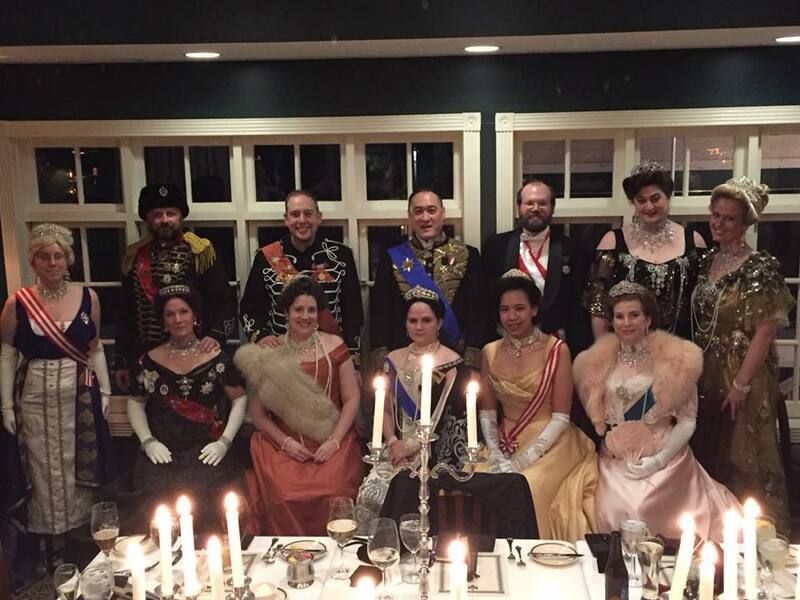 Here's a picture of the Last Csar Dinner group photo! We had an amazing time, a sit down dinner of delicious food: I chose the soup special (cauliflower and feta cheese), filet mignon, and a pumpkin mousse tart! My dress was finished in about two weeks (since I was frantically sewing for another event right before this one, I'll post on that soon). I was originally planning on adding sleeves (Russian style court sleeves were planned but I ran out of time so I may add those for a later wearing). 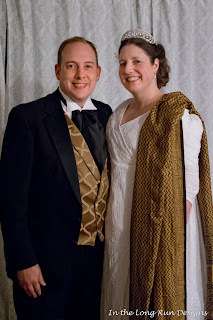 My 1898 evening/court gown is sleeveless and finished with a vintage fur, and lots of bling! We had such a fun evening! 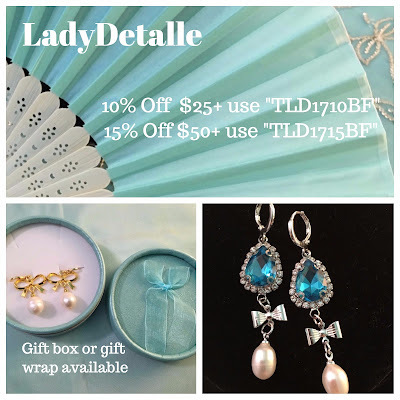 Tiara with matching necklace and earrings set, extra long and long real pearl necklaces are LadyDetalle on Etsy, as are my matching real pearl bracelets. Catherine the Great crown bow order by Etsy seller Queen & Cavendish, and I made our 'bee orders' as well as our other orders either I made or bought/made, along with matching silk sashes. I wore my black 'Balmoral' boots by American Duchess. Hair by me using a half wig of brown curls and a touch of extra hair underneath for support. I didn't get very many pictures since I was having such a great time, but the ones I did get are here. The evening went by so quickly, but we had an amazing and truly lovely weekend: thank you, Judy!